HealthOffice® Portal is an easy-to-use tool for parents to view their children&apos;s basic health information and receive alerts and messages from the nursing office in real-time. Fully integrated with HealthOffice® Anywhere, the Health Portal is an additional add-on product designed to save nurses time and effort through streamlined communication with parents using the mobile app and to equip them with the tools they need to complete administrative tasks more efficiently. Reliable electronic communication and form management between HealthOffice® Anywhere and HealthOffice® Portal allows your district to go paperless. Send and manage letters, forms, documents, notifications, and messages using HealthOffice® Portal, eliminating paper, printer, storage, and postage costs. Save yourself countless hours of phone communication and the hassle of chasing down incomplete forms and referrals by managing correspondence with parents using the integrated communication, alerts, and essential auditing features. Maintain the integrity of your students&apos; data and prevent the risk of exposing sensitive health information often vulnerable through traditional communication methods such as email and fax. 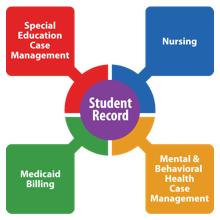 Guarantee the privacy of your district&apos;s students through HealthOffice® Portal&apos;s secure, FERPA compliant environment. Districts have different preferences to the amount or type of information that they share. HealthOffice® Portal provides the opportunity to share an extensive amount of information to parents, but can be partitioned to reflect your district&apos;s preferences. Request a demo today for more information about HealthOffice® Portal and the value it can bring to your district.